The Chic Bargainista®: Fashion 2.0 Awards: For those that wear Prada and Tweet about it! Fashion 2.0 Awards: For those that wear Prada and Tweet about it! For the past year, we've seen the face of fashion evolving via social media. From Burberry's Art of the Trench social media networking site, to designer blogs and runway shows streaming via the Internet, the web has changed everything. Personally, I love that I can beam into Prada and Burberry shows on the Internet. Or talk to Norma Kamali and DKNY on Twitter. You no longer have to be based in NYC, Paris, Milan or London to visit the designers. Their collections come to us via the magic of the Internet. 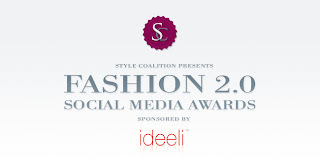 And now you have a chance to give the designers your feedback on their social media efforts via the Fashion 2.0 awards. The awards are sponsored by the Fashion Coalition, the designer shopping club Ideeli and Lucky Magazine. So how to you get to be part of the voting. Easy, by pointing and clicking! You can vote on the Ideeli blog or on the Style Coalition website. There is a special award category for the Innovator of the Year. This is the The Innovator Award, Fashion 2.0. One of my favorite designers, Norma Kamali, is nominated in the Innovator category. How amazingly innovative of Norma to be the precursor of Internet fashion shows by doing fashion videos years ago! Burberry: website, their own social media site, Twitter page, and Facebook page. Dolce&Gabbana: website, their blog, Twitter page, and Facebook page. Norma Kamali: website, ebay shop, Twitter page, Facebook page. So raise your voice and take the poll to tell us which brands engaged you, moved you, and inspired you to shop, dress, and think in 2009. Voting ends on Feb. 8th. Award Season Bling: The Statement Necklace.